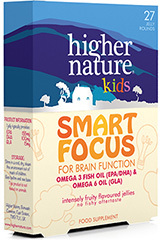 Support your child’s focus in the classroom with Kids Smart Focus supplements. 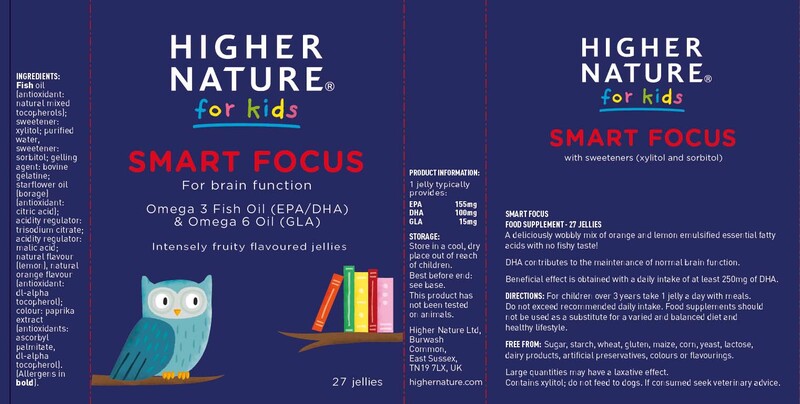 Specially created to aid normal brain function, these tasty flavoured jellies are packed-full of healthy omegas that encourage concentration, for a more productive school day. Balancing omega 3 EPA, DHA and omega 6 GLA, our fruity chews come in yummy lemon and orange flavours - with no fishy aftertaste. Plus, easily absorbed into the system thanks to a mix of emulsified essential fatty acids. 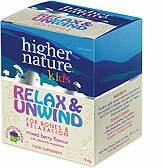 Take 1 jelly a day for children over 3 years. Adults take 2 jellies a day. Do not exceed recommended daily intake. Food supplements should not be used as a substitute for a varied and balanced diet and healthy lifestyle. I have been taking these jellies myself (2 jellies a day) as a substitute for the capsules. I must say that I'm rather enjoying these and find that they are very easy to stomach and don't repeat. 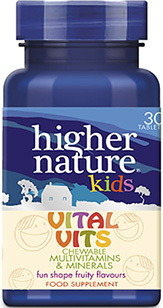 My boyfriend's nephews of ages 2, 7 and 9 enjoy taking them, too, and often remind their mother that they need to take their vits (including Vital Vits and the Vitamin D Spray). 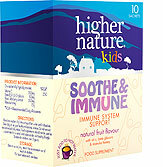 When they first started taking these they didn't realise they were fish oil which is always a bonus (especially with fussy eaters). My 5yr old didn't like them and am disappointed to see that they are only suitable from 3yrs old as I have a 17month old. Is there now no fish oil product for 6months plus is the Smart Start is being discontinued? Both my children have taken that from 6months old and really like it. My 5 year old son disliked these straight away. He said they tasted like fish and eggs. I tried one and I agree. There an orange taste to start but soon dissolves into fishiness' and egginess. Very disappointing. Product returned for refund. Bribery is alive and kicking in our household. But these orange jellies are considered a treat. The children love it!!! Yummy jellies - the kids don't even realise that it's fish oil that they are eating until you tell them. No fishy taste or aftertaste and it doesn't repeat on you... it's great! 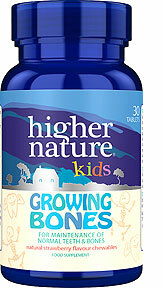 Its been hard to find a fish oil for my kids that they are happy to eat and they love this one! There is much we don’t yet understand about memory and learning. The complexity of the brain is mind boggling stuff and yet supporting good cognitive function is vital for more than eight million school pupils and over two million university students in education this year, many of whom will be sitting tests or exams. As we age, we may worry about the state of our brain and our mental health. For many of us, ‘senior moments’ are a feature of ageing and a reflection of the increasing demands on our brains from our hectic lifestyles. For others, they may herald the onset of dementia. Sadly, dementia is an increasing problem for our society with 850,000 people diagnosed in the UK, affecting 1 in 14 of the over 65s. As we get older, many of us have concerns about our memory and concentration. Recalling names and recent events can become increasingly difficult and can make us worry about dementia. There are many things we can do however to feed the brain and aid the ageing process.